Experts agree: separating the toes properly helps solve common foot complaints like bunions, cramps and heel pain. Loose-fitting marled yarn crew socks with built-in toe separators help align toes while you relax or sleep. 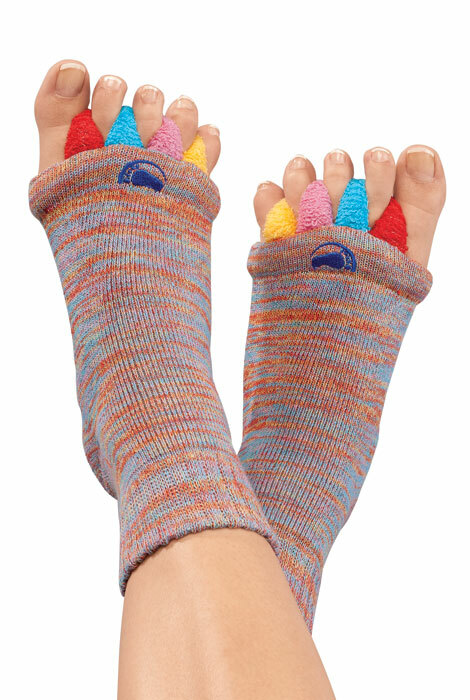 Happyfeet™ toe separator socks are 89% acrylic/8% polyester/3% elastane; machine wash. Imported. Sizes S(4-6), M(7-9). I put these socks on about three times a week after my evening bath routine. They take a little time to put on but you can definitely feel the toes straitening out. They act as an orthotic exercise machine. I am glad I ordered this I am a diabetic and it helps keep my toes separated so I can feel comfortable. To have something to wear while I sleep to help with my bunions. I have serious bunions on both feet and separating toes help circulation. I trying to find something comfortable to help with toe ailment. Just guessing that they may make my toes feel better. i purchased a pair for myself, and i really like them a lot, so i am buying a pair for my friends because i think they will really like them too. Had surgery for bunions and hammer toes. I have a pair of sandals with toe separators and they just make my feet feel good. Because I have a bunion and am looking for pain relief. I had bunion surgery last year. These seem like they would be comfortable to wear at night, to help my toes spread out. Foot pain is relieved in 15 minutes with these. I have bunions that make my feet ache. I believe these will help. I thought they might be good to do a pedicure with and I also have foot pain. My toes were getting too cozy. Separator Socks keeps them better aligned and comfortable. I've wanted it for some time, but your shipping was way too expensive. It was your special shipping that made me decide to buy it today. I have RA and the toe separator should help to keep my toes straight. They were highly recommended by a yoga instructor to provide relief for bunion pain. A friend told me about them. These socks are for my wife to relax her feet and realign her toes naturally. Thanks for this product. I have problems with my toes being to close together. Because I heard that it helps alignment. foot health is important and the socks are a suttle way to protect toe allingment. My toes are are out of alignment. Heard about these socks so I want to try them out!!! looking for foot pain relive that is also cute! I have a bunion on my right foot and would like to try these to see if they can correct the problem without surgery. Having problems with my feet. Trying to avoid surgery. hello, i am a male who wears a size 8 in shoes. What size should i get? BEST ANSWER: Thank you for your question. These will only fit up to a woman size 9 so this most likely will not fit a mans size foot. We hope this information will be of help to you. VWhere can I get these in women's size 11? BEST ANSWER: Thank you for your question. we do not carry the large size and are unsure as to who would. We suggest doing a general Google search. We hope this information will be of help to you. what is size range for small or medium sox? BEST ANSWER: Thank you for your question. You may consult the size chart located in the description to help determine which size would be best for you. We hope this information will be of help to you. Do these socks come in large size? will be of help to you.